On the outside, professional cycling looks pretty glamorous, with the coloured Lycra, shining bikes and beautiful scenery. What people don't see though, are the four-hour bus journeys in between stages and the below standard 'hotels' we often have to stay in overnight. Last night we were housed in a roadside hostel that could only aspire to having one star on its wall. The wood panelled rooms smelled like rotting trees and the beds and carpets were probably there since the place was built. But with three days left, we were all too tired to care. As we were finishing at the summit of the 17km climb to the Naturlandia ski station in Andorra today, our team bus had to leave 50 minutes earlier than usual to allow time to get through customs before entering the principality, which left us a choice of either going to the start village or sitting in the team car until the race began. I used the time to try and sort out my apartment-moving woes before riding to the line. 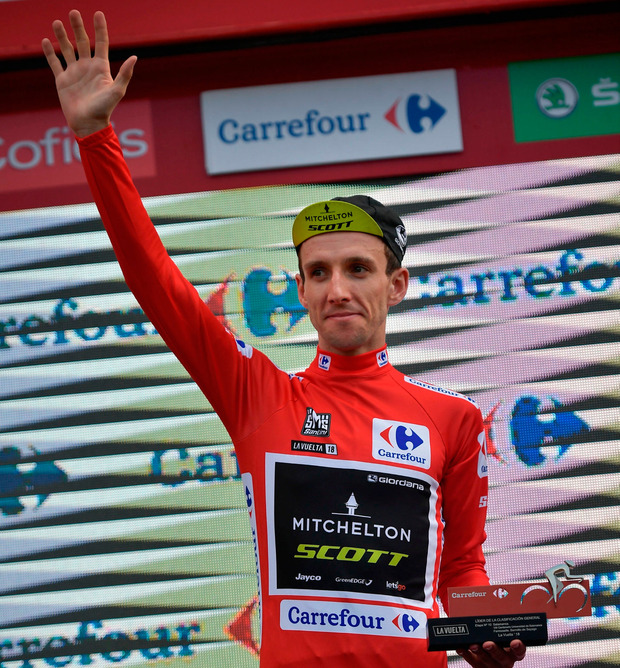 Although today's stage dragged upwards from the off, the focus of the day was the final climb, so I wasn't sure whether the GC teams would allow a breakaway up the road this morning or if the Movistar team of second-placed Alejandro Valverde wanted to try and close the Spaniard's 25-second deficit to race leader Simon Yates by controlling things and going for the time bonuses on offer for either the intermediate sprint at the bottom of the climb or the stage win at the top. To suss out the situation, I turned to one of the Movistar guys beside me on the start line. "Well, what's your plan today? Is it worth even trying?" "No," came the reply. "We're going to go for the stage." From that moment, I knew any early escape would be doomed, but I still hung around the front as the first attacks came to see what happened. It soon became apparent that Movistar didn't want any more than three riders going clear. All bigger groups were reeled in while a couple of smaller fish were thrown back out front. After about 40km, three riders did get clear but when Movistar didn't give them any more than a minute and a half's slack, they just played them at their own game and sat up 20km later, sparking even more attacks when they were caught. Again, big groups were chased down before another trio went clear. Again, Movistar only gave them a minute and a half, so one of them sat up. The pace was so hectic we covered over 90km in the opening two hours. With 34km to go there was a big split in the peloton. On TV, it probably looked like Movistar split the group in the cross wind but the reality was that there was no crosswind. As we crested a small ridge coming out of a town, the TV motorbike was so close to the riders that when it accelerated it dragged the whole Movistar team and a handful of others clear with it, leaving race leader Yates and the rest of us scrambling behind them at 70kph for five kilometres to close the gap. Every time I've raced in Andorra, the pace to the final climb has been mental and with the two leaders still dangling clear and Movistar trying to shut them down before the intermediate sprint, today was no exception an we hit the bottom of the mountain at 60kph. Sitting in the top 30 or so, with 50 minutes of climbing ahead of me, I wasn't looking to stay with the top guys but didn't want to stay with the grupetto; where if you go a bit too fast they give out to you, if you go a bit too slow they give out to you, so I hung on for a kilometre or so before riding to the top with a small group. Demma took 12th on the stage as Frenchman Thibault Pinot earn his second win and Yates consolidated his lead over Valverde to 1'38. The plan afterwards - to get to the bus, get changed and travel the winding mountain roads to our next hotel in the quicker team cars went well for about 10 minutes until the local police held all the cars for 40 minutes at a junction so they could let the team buses through. Tomorrow's stage with six mountains crammed into 96km, is last chance saloon for everybody on this Vuelta bar the sprinters.